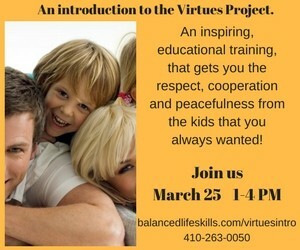 Balanced Life Skills is offering an “Introduction to the Virtues Project: Awakening the Gifts of Character”. This training/workshop is excellent for parents, teachers, personal development, even organizations. The Five Strategies and all of the virtues have been noted by the United Nations as a model program for people of all cultures because it honors and offers hope to people of all religions, races, and ethnicities. It is a global initiative being used in more than 100 countries worldwide. April 29 & 30, 2017 we will offer the two-day 12-hour training covering all Five Strategies. The cost of this training is $350 and includes lunch and materials for the training. Anyone who chooses to take the three-hour course and then decides to register for the two-day course, we will apply $50 to the tuition for the two-day training. For groups in the future the “Introduction to the Virtues Project: Awakening the Gifts of Character” will be offered as a 6-week course, a 4-week course, or two-day course.